The early bird usually catches the worm, but this was not the case for fans of a popular Korean actor on Tuesday. Local fans of Kim Soo Hyun, from hit TV series My Love From The Star, were in tears on Tuesday morning when they saw on the Sistic website that tickets to his fan meeting here on April 27 had "sold out" in 20 minutes. Many had woken up well before the online sale of the tickets began at 10am, so that they would be ready to buy the coveted Cat 1 tickets that cost $238 each. Some of them cried as they were desperate to get the best seats at Singapore Expo Hall 1, where the 2014 Kim Soo Hyun Asia Tour 1st Memories In Singapore will be held. These despondent fans ended up buying the Cat 3 ($138) tickets, which they said was the only category available at that time. Altogether, 2,500 tickets divided into three categories - Cat 1 ($238), Cat 2 ($188) and Cat 3 ($138) - were up for sale. The New Paper understands that "late" fans who booked tickets at 3pm - five hours after tickets were released for sale - managed to clinch the Cat 1 tickets and could not believe their luck. Student Sherjin Lee, 17, told The New Paper: "I forgot that the sales for Kim Soo Hyun's fan meeting started (on Tuesday), so I went online around 1pm. "My friends told me that tickets for Cat 1 and Cat 2 had been sold out and they had to buy the Cat 3 ones. But I decided to try anyway and managed to buy a ticket for a fantastic Cat 1 seat!" A check with a Sistic telephone operator revealed a possible reason for this unique situation. When one selects a seat on the ticket booking website, the ticket would be held for 15 minutes for the consumer to complete the sale. Said the operator: "When many people started booking tickets at 10am, they held many tickets. "When all the tickets were temporarily reserved, the system would reflect that there are none available for sale. Eventually, when these tickets were released and taken off hold, they became available again. Customers called to ask about the Cat 1 tickets and I told them to try again later." 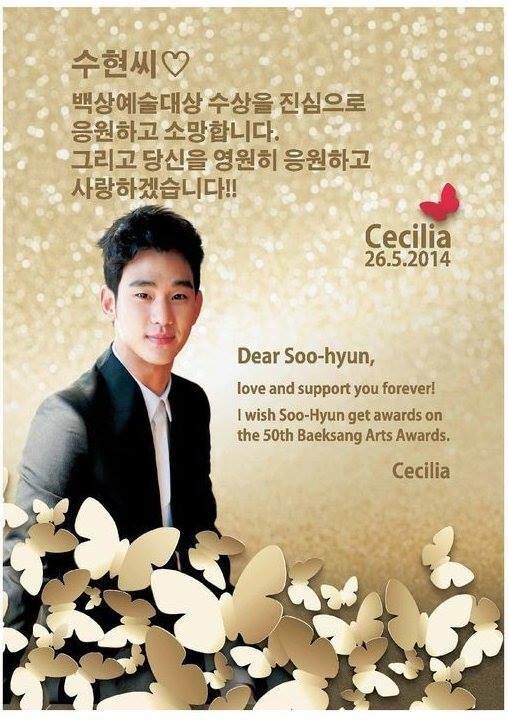 The ad was published in the run-up to the 50th Baeksang Art Awards, on today in Seoul and cost almost S$50,000. The advertiser did not disclose who Cecilia was, but Yonhap news agency reported that she is said to be the wife of a Hong Kong business tycoon. The 27-year-old sensation was nominated in four acting categories for his film Secretly Greatly and drama My Love From The Star. 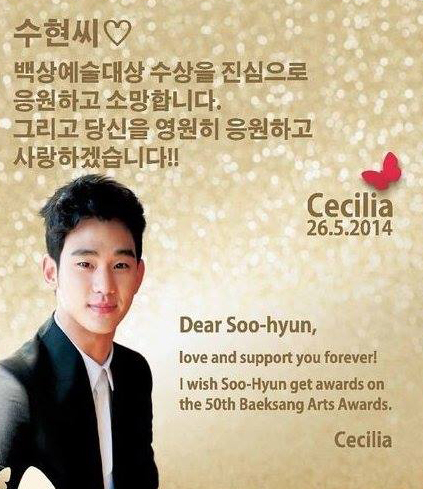 "Cecilia wanted to run the ad to give strength to Kim Soo Hyun," an official from the Chosun Ilbo newspaper was quoted as saying. From time to time, fans have collectively posted newspaper ads to show their support and love for stars, but this is the first time an individual has placed a full-page ad. Some die-hard Singapore fans are considering breaking the law just to get a chance to get really close to him. Some Singapore fans are contemplating buying fake IDs in a desperate bid to get up-close with their idol at his upcoming fan meet here. The fans are thinking of buying fake IDs which would have their birthdays doctored to reflect April 27 in order to get a chance to be up-close with him. 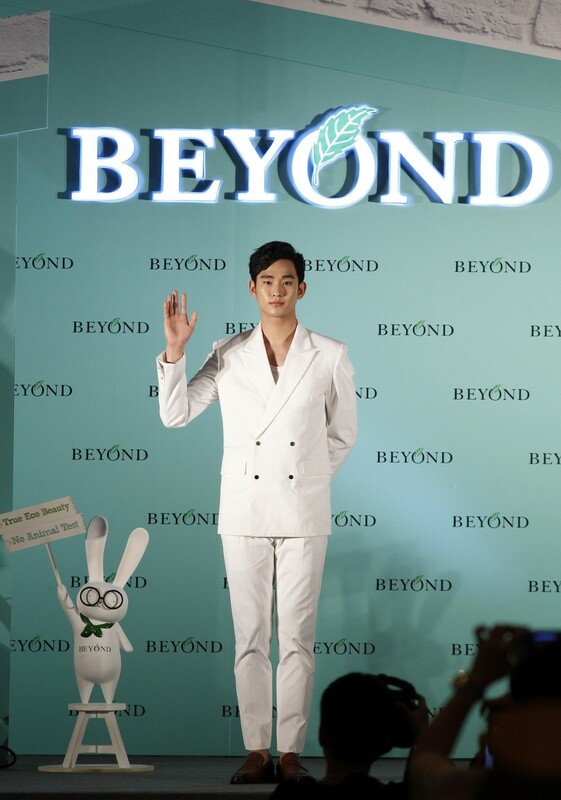 Kim fever swept into town after it was confirmed that the top Korean actor (left) will be here for 2014 Kim Soo Hyun Asia Tour 1st Memories In Singapore on April 27 at Singapore Expo. A fan said she has heard from friends that fake IDs can be made here but has yet to meet someone who can actually do it. Kim is known to set pulses racing in over-the-top ways: He had girls wishing they could marry aliens after he played one in blockbuster Korean drama My Love From The Star. Crazy fans are thinking of buying fake IDs which would have their birthdays doctored to reflect April 27 in order to get a chance to be close to Lee Soo Hyun (R). My Love From The Star stars Gianna Jun (in red) and Kim Soo Hyun (middle, on stool). 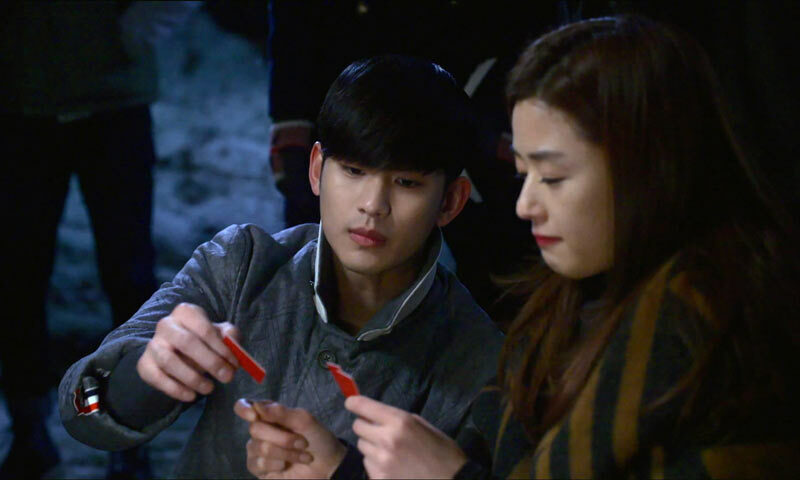 Korean drama My Love From The Star, starring actress Gianna Jun who plays superstar actress Cheon Song Yi, and actor Kim Soo Hyun who plays Do Min Joon, an alien professor. 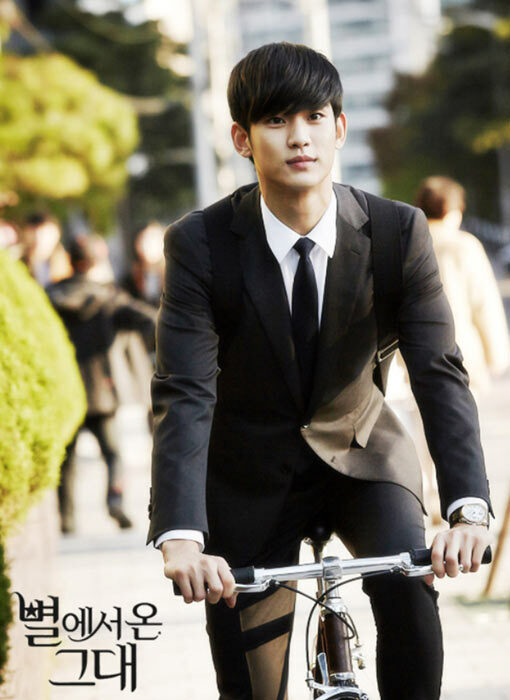 Korean drama My Love From The Star, actor Kim Soo Hyun plays Do Min Joon, an alien professor. Actress Bae Suzy (right), from girl group Miss A, makes a cameo appearance. Korean drama My Love From The Star, starring actress Gianna Jun and actor Kim Soo Hyun who plays Do Min Joon, an alien professor. South Korean actor Kim Soo Hyun attends his "1st Memories In Taiwan" press conference in Taipei on March 21, 2014. Kim will meet with fans in six countries. South Korean actor Kim Soo-Hyun attends his "1st Memories In Taiwan" press conference in Taipei on March 21, 2014. Kim is known to set pulses racing in over-the-top ways: He had girls wishing they could marry aliens after he played one in Korean drama My Love From The Star. 25-year-old heart-throb will be celebrating the birthday of anyone born on the day of the fan meet - April 27. Kim is known to set pulses racing in over-the-top ways: He had girls wishing they could marry aliens after he played one in drama My Love From The Star. 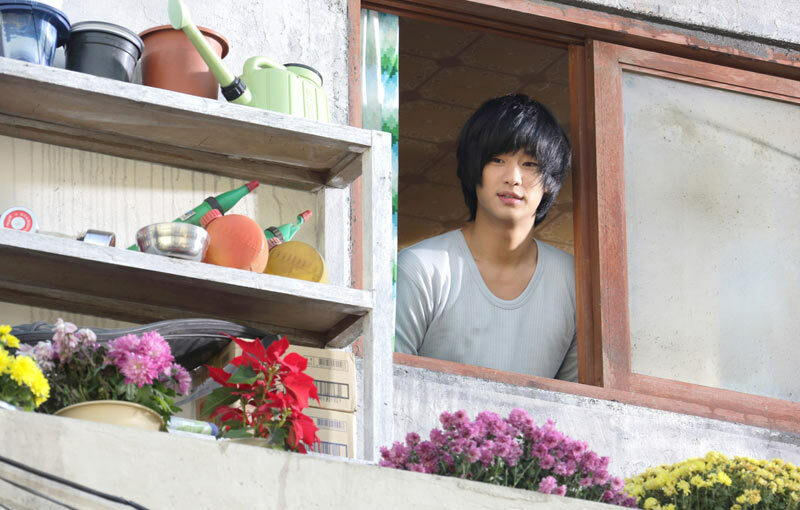 Ms Alina Kwok, a 32-year-old teacher, said: "I love Kim Soo Hyun and would do things like fly overseas to stalk him." Ms Alina Kwok, a 32-year-old teacher, said: "I love Kim Soo Hyun and would do things like fly overseas to stalk him. 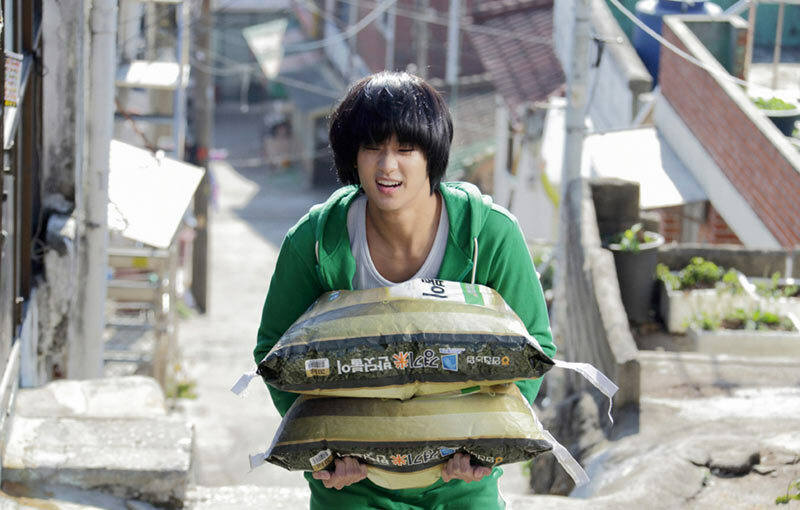 Is Korean star Kim Soo Hyun (R) worth potentially going to jail for? Some fans are thinking of getting fake IDs just to be with him up-close. The fans are thinking of buying fake IDs which would have their birthdays doctored to reflect April 27.